opinion or institution, is Poetry. Voices from the American Land is proud to announce the publication of our tenth chapbook, Joan Naviyuk Kane's The Straits. Launched at an October 6th event at Alaska Pacific University, The Straits will be mailed to our membership and available through our website mid-October. Please visit Joan Kane's author page for more information and to order copies. Voices from the American Land is an unusual land conservation program that uses contemporary poetic voices to “move the message of the land.” Through chapbook publication, local readings, and educational activities, we seek to revive and amplify a dominant tradition in American letters: the poetry of place. In this way, we seek to celebrate and help protect America's extraordinary heritage of land and landscape. How do we do this? With the help of an Advisory Council, our volunteer Editors select the locales — outstanding cultural and natural landscapes — and the authors whose poetry can vividly reveal these landscapes. Three times a year we publish a chapbook celebrating a specific landscape. We organize local readings, and host lively and engaging events to focus attention on the specific conservation qualities of the region. Our first aim is to reach residents of the area, reinvigorating their appreciation for their home ground and supporting their efforts to protect it. The overall scope of the program reaches beyond the specific locales, though. We engage superb poets and promote their work to a national audience. The pleasure afforded by the poetry will, we believe, lead to a richer engagement with our outstanding landscapes — and to a more significant understanding of the issues that face them. We invite you to join us in this work. The program is supported primarily by “Voices Associates,” a distinguished group of member-subscribers who provide annual donations of $50 to $500 and receive, in turn, a complimentary subscription to the chapbooks. Those contributing $100 or more are listed in the chapbooks issued during their term of membership. We’d love to hear from you about the landscapes that matter to you. Write to us at editors@voicesfromtheamericanland.org. Message us on Facebook. Thanks for your interest in this work — and for the care that you bring to your own treasured landscapes. 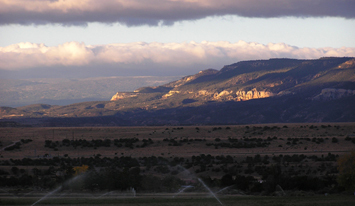 Voices from the American Land gratefully acknowledges the support of the Pleasant Rowland Foundation, the New Mexico Humanities Council, the Conservation and Research Foundation, and individual sponsors.